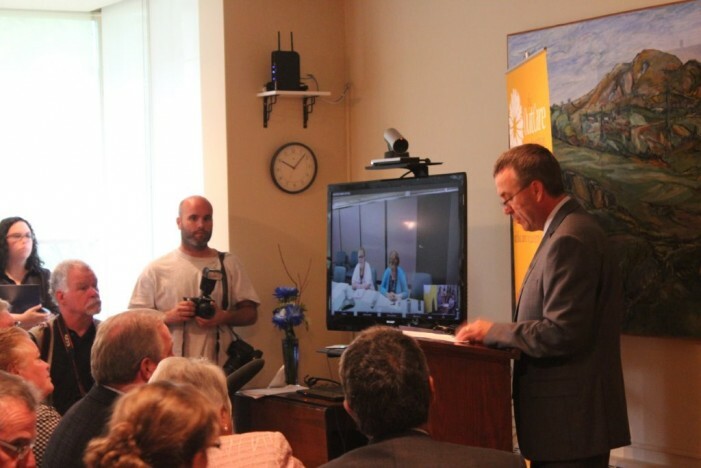 CFN – The OutCare Foundation is pleased to announce that telemedicine is now being used for palliative care throughout the Champlain region. Thanks to the success of its recent Telelink fundraising campaign, more patients with a terminal illness can access the care they need. Telelink uses the latest technology to connect 12 palliative care sites to the Ontario Telemedicine Network’s (OTN) secure videoconferencing network. High definition video-conferencing equipment makes it possible to bring teams hundreds of kilometers apart together for meetings and distance education. Used by over 1,600 healthcare sites across Ontario, this is the first time that hospices in our community are connecting to palliative care teams in acute care settings such as hospitals using this technology. Nurses, doctors and others involved in palliative care can now discuss complex cases and conduct clinical consultations from a distance. They, along with their team of volunteers, can participate in up-to-date training on topics such as pain and symptom management, without the need to travel. For the over 6,000 patients served annually by these sites the benefits include timely treatment, reduced travel and improved care, resulting in a better experience. When the Champlain Hospice Palliative Care Program – the regional authority – approached the OutCare Foundation about this project, OutCare recognized the great potential impact of Telelink. “By connecting the palliative community, we knew that this project could play a powerful role in the quality of care available to those who need it,” explained chairman, John Bradley. “It just made sense for OutCare – the only charity raising funds for regional palliative care – to take on the challenge of making Telelink happen.” Thanks to generous donors and supporters this $380,000 project is expanding palliative care expertise throughout Eastern Ontario. The OutCare Foundation is the only charity devoted to raising funds for palliative care across Eastern Ontario. It supports patients and their families by raising money for projects, such as Telelink. With expert advice from the Champlain Hospice Palliative Care Program, OutCare selects high-priority projects with a regional impact so that regardless of which organization families turn to, they receive the skilled and compassionate help they need and deserve. Over the years, the Foundation has provided $1.5 million in support for programs and services throughout our community. Whether helping to make more care available, supporting caregivers, or ensuring proper training is offered, OutCare donors are making a difference. · Improves quality and standard of palliative care in Eastern Ontario. · Established a secure link to plan care and foster seamless, patient-focused services, including remote patient assessments. · Fully immersive distance education and access to training archives. · Access to an established healthcare network of 1,600 sites. · Implemented in the summer of 2013. · Benefits the over 6,000 palliative patients served annually by the sites. · The sites: Beth Donovan Hospice, Bruyère Continuing Care Palliative Care Program, Carefor Cornwall Hospice, Champlain Hospice Palliative Care Program, Hawkesbury & District General Hospital Palliative Care Unit, Hospice Care Ottawa (May Court Hospice & Central West Hospice), Hospice Renfrew, Montfort Hospital Palliative Care Consult Service, Queensway-Carleton Hospital Palliative Care Consult Service, the Ottawa Hospital Palliative Care Team (Civic Campus & General Campus). · Major donors and partners: Cisco Canada, the Ontario Trillium Foundation, the Champlain Local Health Integration Network, the Kiwanis Club of Ottawa, the Community Foundation of Ottawa: Canyon Foundation Fund, the Healing Cycle Foundation, the GlaxoSmithKline Foundation, and the Military and Hospitaller Order of St. Lazarus of Jerusalem, Ottawa Commandery. Thank God not all the medical services available in Eastern Ontario are driven by personal agendas. Patient care should come first. Very well said Reg ,agenda’s do tend to come first ! It’s fast becoming where budgets are more important than patients!